At the start of May, 260 model elephants took to the streets as part of London’s Elephant Parade. Each is the size of a real life baby elephant, glittering with the decorative genius of the UK’s leading creative talent. 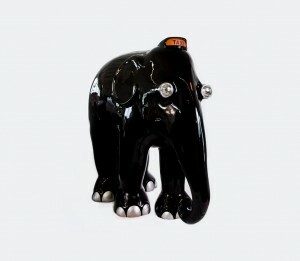 This fantastical scheme is the brainchild of The Elephant Family, a charity that works towards the conservation of Asian elephants. Each colourful creature has been sponsored and will be auctioned at Sotheby’s on 30th June. Golden Goose PR client, the Royal Exchange is host to four such magical beasts, created by Cartier, Sir. Paul Smith, Tarun Tahiliani and London-born artist, Benjamin Shine. Benjamin’s Taxi Elephant is set to be the object of a fierce bidding battle and the Royal Exchange has employed a 24-hour guard to deter potential ellie-nappers. The sleek black elephant is powered by a solar cell so that the taxi sign lights up at night and its eyes are transformed into headlamps!